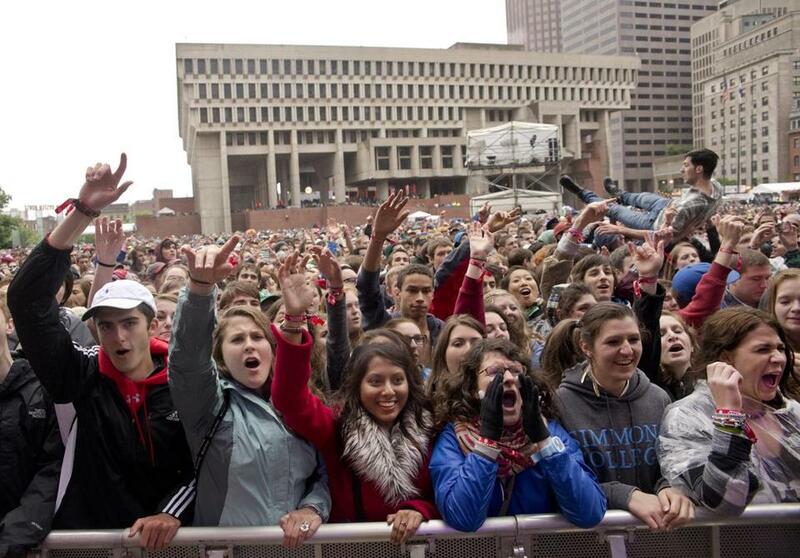 Fans listened to musical performers at the Boston Calling Music Festival at City Hall Plaza in May 2013. The city of Boston spent $650,000 to test surveillance software during last year’s Boston Calling music festival, using the technology to record the crowds of concertgoers without their knowledge. No similar surveillance at public events — including this past weekend’s Boston Calling festival — is scheduled, a city spokeswoman said. But she acknowledged that future tests of systems with similar capabilities may also be done without notifying those being recorded. Systems like the one tested by Boston can be used for many purposes, including everything from alerting police to abandoned bags to sorting people by height or skin color. The city last month acknowledged that it participated in the pilot project at last year’s festivals in May and September, during which IBM demonstrated what the city calls “situational awareness” software. The city denied using the technology’s ability to track individuals based on race or other characteristics. The surveillance, which the city said used existing security cameras, was revealed when a journalist found documents and video recordings from the project on the Internet. Reports on the surveillance program appeared in the alternative weekly DigBoston last month. City spokeswoman Kate Norton said the $650,000 bought temporary or limited licenses for the software as well as IBM setup and support. The city decided against purchasing the software, saying in a statement that its practical value was unclear. But Boston remains interested in similar software despite criticism from privacy advocates. The goal of the project, which occurred under the previous city administration, was to see whether the software could help with public safety, management of crowds and traffic, and other concerns during large public events, Norton said. Situational awareness software analyzes video and provides alerts when something happens. For example, if someone walks into a secure area in view of one of the system’s cameras, the software would raise a red flag. More sophisticated systems can track people in real time as they move through crowds — such as following an unauthorized person in the area — without requiring dozens or even hundreds of human analysts to watch video feeds. IBM did not return calls seeking comment about the demonstration, but in an e-mail, company spokeswoman Holli Haswell said neither “face capture . . . nor facial recognition” were used at the event. Whether facial recognition or other tracking was used in the project is beside the point, said Kade Crockford, director of the Technology for Liberty Project at the American Civil Liberties Union of Massachusetts. Crockford said the city’s test of the system was only revealed because an IBM employee uploaded the data that DigBoston found to a public server. Citing company policy, IBM did not comment on the data breach. “The city, like many cities, has a bad habit of implementing costly surveillance programs and not informing the public ever,” Crockford said. Boston remains interested in software with these capabilities, Norton said, though she acknowledged that its implementation raises questions. “There are a number of challenges presented by using this type of software, including, but not limited to, infrastructure support as well as legal and privacy concerns,” Norton wrote. There are no immediate plans to test similar software at any upcoming events, she wrote. Neil Richards, a Washington University in St. Louis law professor and privacy expert who grew up in Boston, said technology like the software that IBM deployed in Boston has progressed faster than the rules that govern its use. Lawrence Friedman, a lawyer and professor at New England Law in Boston, said the city’s actions do not appear to have broken any laws. The subjects of the surveillance — ostensibly anyone who attended the festivals — were in a public place, where anyone was free to photograph them as they pleased. “All of the laws in this area, where we’re concerned with the government looking at us, are based on predigital-world technology,” Friedman said, referring to when computer systems capable of tracking every individual in a crowd and storing their images forever were the stuff of science fiction.